Today I want to tell you about a lovely new company I’ve discovered called Di Palomo. Di Palomo was started by three friends in Devon whilst recalling their memories of time spent together in Italy. They currently offer four different ranges, Tuscan Rose, Wild Fig & Grape, Orange Blossom, and Wild Grape. Each collection comprises of a whole host of bath, body and fragrance products, including fragrance, body butter, candles, lip balm and soaps. Since that very first inspiration, quality, style and attention to detail have been combined to create a truly indulgent collection of bath, body & fragrance products. Exquisite packaging, and complex fragrances, instantly take you to scene of the inspiration … from a Tuscan farmhouse in the early morning to an evening walk through the orange groves or a vineyard overlooking an Italian lake. 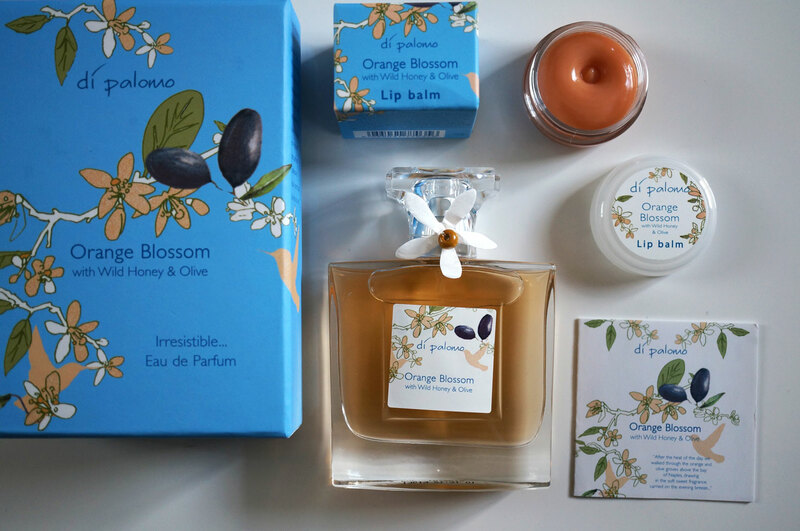 The Orange blossom EDP (£25) is a soft, sweet fragrance, inspired by an early evening walk through orange & olive groves above the Bay of Naples. With top notes of, bergamot, mandarin & orange blossom leading to middle notes of jasmine, honey & geranium, resting on a base of sandalwood, olive, amber & musk. This fragrance just takes me straight to the Tuscan countryside, I close my eyes and I’m transported there – God I need a holiday abroad, ha ha! The Orange Blossom Lip Balm (£4) is a luxurious lip balm with beeswax and shea butter that melts on the lips to give a soft shiny finish with a subtle tint. This lip balm is so fabulous, it smells just like oranges and I can’t stop using it! It makes my lips feel soft and supple for hours. So what do you think? Don’t these products sounds gorgeous! Next Post NEW MAC Collection! A Novel Romance for Autumn 2014!